With a stay at Apartment Cà Dorè, you'll be centrally located in Venice, just a 4-minute walk from Ca' d'Oro and 7 minutes by foot from Rialto Bridge. With a stay at Residence Sassi San Gennaro in Matera, you'll be within a 5-minute walk of The Sassi and the Park of the Rupestrian Churches and Cathedral of Matera. When you stay at this apartment in Pozzallo, you'll be near the beach and 9 minutes by foot from Cabrera Tower. When you stay at Residence Lago Sila in San Giovanni in Fiore, you'll be on a lake and steps from Sila National Park. Free self parking is available onsite. Located in Orbetello, Residence Talamone Il Poderino is minutes from Talamone Beach and close to Talamone Port. The front desk is staffed during limited hours. Free self parking is available onsite. 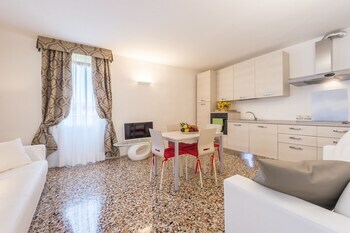 With a stay at this apartment in Milan (Central Station), you'll be within a 15-minute drive of Corso Como and Teatro alla Scala.